Floating Away: The Yellow Mustard Belt is Back! I certainly hope everyone watched what I watched this morning as Joey Chestnut made history in Coney Island at the Nathan's Hot Dog Eating Contest. Chestnut rocked the international food eating world as he set a new world record with 66 HDB (hot dogs and buns) in 12 minutes and beat six time champ, Takeru Kobayashi. Chestnut, as the winner, gets to bring the coveted yellow mustard belt back to America. As usual, the competition was broadcast on ESPN and while the contest was entertaining, the real highlight was color commentator Richard Shea who sprinkled in some true gems during the twelve minute contest. "I dont know if you have ever had your wisdom teeth removed, but its a pain like a Peyton Manning cell phone commercial." "You google hero tomorrow . 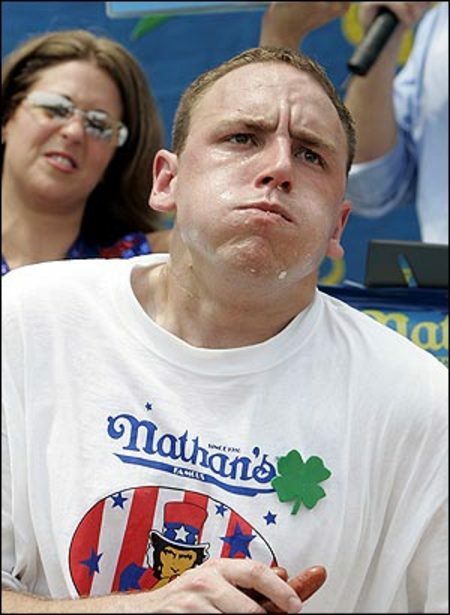 . . American hero, you're gonna get Abe Lincoln, possibly Neil Armstrong, Taylor Hicks, and then this man, of course, Joey Chestnut." "Well Curt Schilling be damned. Kobayashi is bringing it, he's just two hot dogs behind Chestnut right now. We have nearly four minutes remaining in this competition. The table enders now not even in focus because the entire world . . . the entire free world is focused on these two men." "This would be the greatest moment in the history of American sports if Chestnut can bring the belt home to Coney Island." "He [Chestnut] may have indeed changed the course of this nation . . . Chestnut is a true American hero." "It's a great day for America." It truly is. Thank you, Joey Chestnut for letting me watch sports history. Google gets into the messy business of telecommunications. I don’t mean to say Google’s day job is easy but the telecom market gets it involved with government agencies like the FCC on a more regular basis. Like many other large telcos the company will have to spend more and more money lobbying and technology differentiation may be less important than government regulations in ensuring future success. not intended for me, but it isn't paid, but if you're working events (aside from meetings) they make you get the employee pin number and that number makes it easier for them to hire you later or work other events. i'm dumb. whats the fashion board? From what I know, it's basically a teen fashion/style advisory board that is done by BP/Nordstrom. is it only open to highschoolers/people in certain regions? You can only apply if you are currently a high school junior, and then you work throughout your senior year.